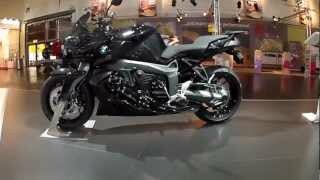 The BMW K 1300 R or rather BMW K1300R ✅ is a modern Roadster or Nakedbike. Compared to the completely covered version K1300S the K1300R has a higher handlebar. The engine is the same, a 4-cylinder in-line-engine, this time with 173 HP and 140 NM which is brought forward to the rear wheel by Kardan. From there it speeds up the 243kg. This Nakedbike can most suitable be modified with Carbon, CFK or GFK cover pannels e.g. our Carbon rear wheel hugger or Carbon Engine Spoiler. For more power and a sporty sound we recommend the Remus Hecacone Exhaust System. Our Windscreens offer a better wind protection. In baggage and storing room we have Cases, Topcase, Tail Bags and Tank Bags. For longer tours we can modify your seat bench. With our Clear Indicator Lenses you get great visual effecs. Not only for beatuy but also for your comfort our foot peg lowerings are a must-have, as well as our Aluminium Wheels, Main Stand, Superbike Handlebar and our Crashbars. In Navigation and GPS receiver we rely on TomTom and Garmin as well as in Intercom System on the Interphone. In the category Spares we have engine oil, transmission oil, batteries, gel-gatteries, oil filter tools, oil filter, air cleaner, break pads, break discs, sparking plugs and battery chargers. With our garage trolley you can easily park the relatively heavy K1200GT and our paint protecion avoids scratches.